3.3 Upload in the category "Student Work"
All submissions will be promoted on the IIIDaward website. Shortlisted submissions - minimum 5 in each category - will be displayed at the 2017 VisionPlus Conference in Riga as well as being part of the Exhibition on Tour. Announcement of award winners and honourable mentions will be made via IIID channels, media partners and the Information Design Journal . Please download here the template for your entry. Feel free to design it according to your needs, with text, diagrams and images, just please stay within the grid and the Univers Font and answer the three questions. Thank you. 1) Information design projects published, completed, finished, realized up to 2017. 2) Submission can be made by either the designer or client. 3) The entry fee is valid for a single project in a single category. A project can be entered in multiple categories, but each category submission must be entered individually with the accompanying fee. 4) Submissions to be written in English. 5) Be aware of the submission deadline, no late entries will be accepted. 6) The submission procedure is not complete until payment has been received /confirmed. Please submit your proposal to the category that you feel is the most appropriate. If you have questions about which category to enter, please ask. Prepare your PDF submission after reviewing the submission form on the IIIDaward website. Submissions are limited to the 2 page PDF format. No additional material may be submitted. You information prepared, access the online submission system below, complete the necessary data entry and upload your PDF file. Once your payment has been received, you will receive a receipt for payment and an email confirming your submission is complete. 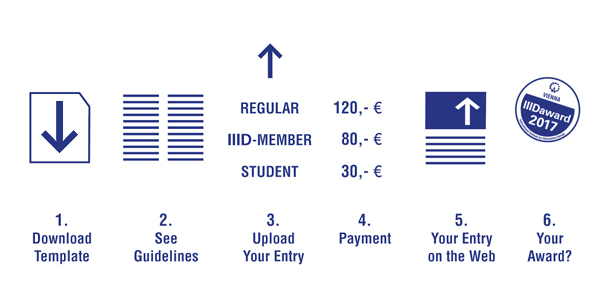 Beginning with September-10, your submission will also be made accessible via the IIIDaward website and on Facebook. If your entry is one of the winners or shortlisted projects in each category, you agree to the award costs of 190,- Euro per submission, which includes the trophy, the entry in the awardbook, the winners online gallery, the presentation within the IIIDaward exhibition, an online deisgners or agencys profile, the use of the IIIDaward-2017-label. Awards costs are not applied on the category Student Work. Please use the template and submitt your entry - max. 2 pages as a PDF-file. If you want that your entry is displayed on the IIIDaward website an on facebook, please provide us with an additional jpg-file (600 x 300 pixel, landscape) and a short text about your project. Thank you. 1. Can I submit to more than one category? Yes, you can submit to as many categories as you like. However, each submission must be done individually, and you must pay the entry fee for each. 2. Which category should I submit to? Which ever category you feel best reflects your submission. You can submit to more than one category, if you like (see above). If you are unsure, please contact us. 3. Do I have to come to Vienna if I want to receive my award? We would love to have everyone come to Vienna, but realize it might not be possible. Award winners will receive their award, regardless of whether or not they are present at the award ceremony. 4. How much does it cost to submit? a) Promoting the submissions online is one advantage of the IIIDawards and advances awareness about information design and the submissions. b) Our judges are evaluating the submissions based on defined criteria, which doesn't include how much they like or know about an entrant. We trust that our evaluation team will make their decision based on the quality of the projects, and because short-listed finalists are reviewed by more than one jury member, personal opinion is balanced by the group decision making process. - What was the challenge? - What was the solution? - What was the effect? For your entry please feel free to use the two pages according to your needs, as long you stay within the grid. By submitting your project to the IIID Awards, you agree to terms and conditions outlined in the call for entries. Submissions will not be returned and will become property of the IIID and may be used for promotional purposes in accordance with the aims of IIID. Attractiveness and elegance, well understandable and easily applicable information. Whatever you may be, as long as your designed information serves a purpose and is beneficial for the user. It is the opportunity show up, with your best works and projects for the sake of the discipline of information design, presented to the entire worldwide design community. Open to those who are studying to be or act as information designers regardless the discipline of the faculty with no restriction on the theme of the submission. If the name of your bank account does not identify you personally, please make sure you give your name in the field for the intended purpose of the transaction. You will receive an invoice, when the transfer is completed. Obviously, you are proud of your work and we feel it deserves some attention. And while we can only have one winner, all submissions will be promoted in the gallery on the IIIDaward website. Entries will be searchable via submitter and category. submit 3 projects and pay only for two. All of them will be published in the IIIDaward 2017 book. The announcement at the IIID Vision Plus conference 2017. The IIIDaward exhibition on tour. A IIID membership 2017 for the winners in a category. You are entitled to use the IIIDaward label for the next 3 years.